You know you're in trouble when your mechanic asks, "Have you talked to your insurance company lately?" 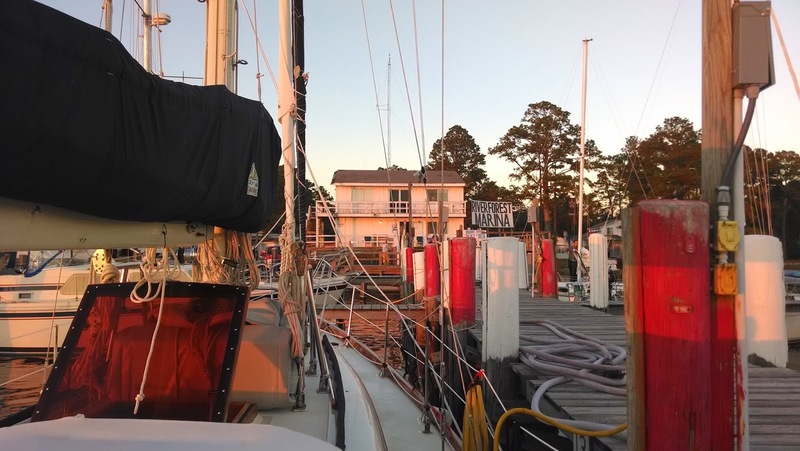 We shoved off from the Manteo marina on Thursday morning with our rebuilt engine purring like a kitten. 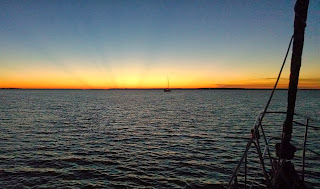 We babied the motor by keeping the RPMs at 2,200, and ended the day with a delicious chicken dinner in a quiet anchorage at the south end of the Alligator River. Cash and Nicole started holiday preparations by practicing Christmas carol duets on the guitar and recorder. 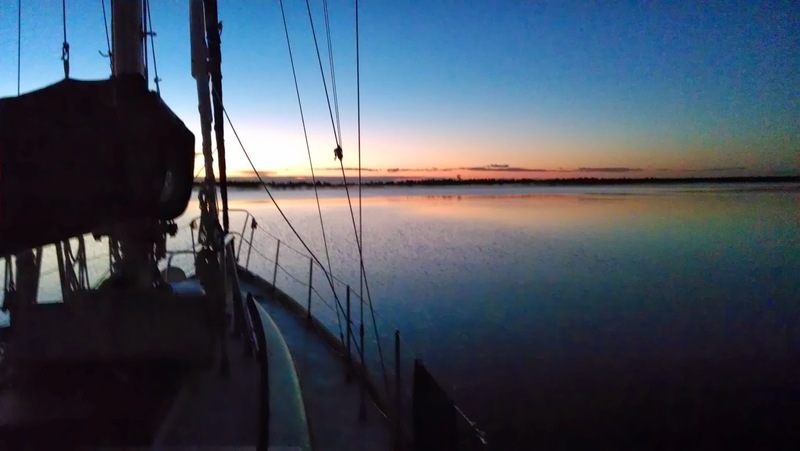 On Friday we hauled anchor with the sunrise. 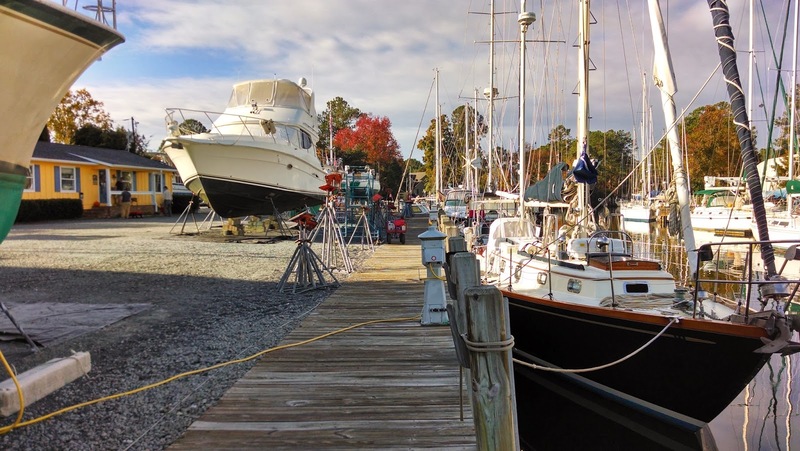 We ran our engine at 2,500 RPMs and traveled the 21-mile canal that leads to the Pungo River. 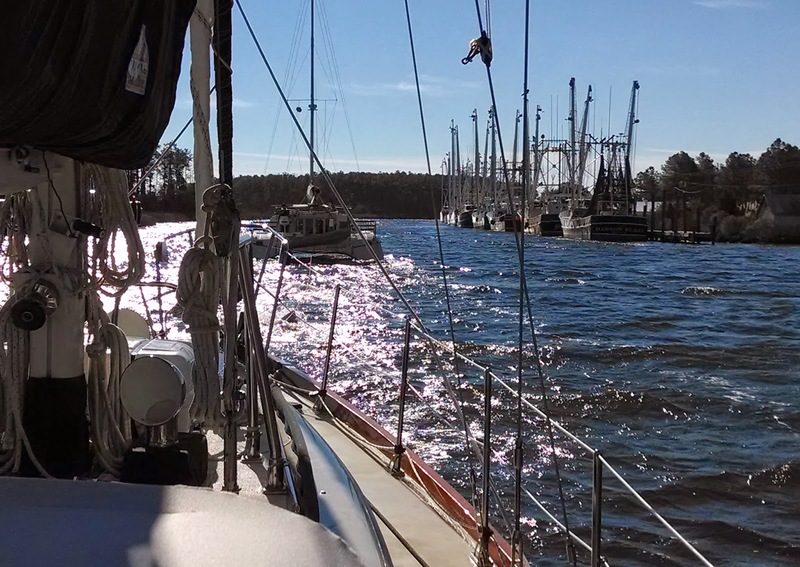 We anchored in the mouth of Slade Creek, about half-way down the Pungo, on the way toward the Pamlico River. Dinner was pork chops, potatoes and broccolli, and then Cash beat me in chess before we all turned in for an early bed-time. We rose on Saturday to find a thick cover of fog that allowed us a leisurely breakfast. We got under way once it cleared. We could run at 2,800 RPMs, before revving things up to normal engine speed the following day, so we were looking forward to making it to Oriental, NC, a good town for sailors. Shortly after hauling anchor, Greg checked the engine as he had done multiple times the previous two days to make sure all was well. Coolant was spraying out into the engine compartment. Really?! Again? What happened to our purring kitten? weeks getting an engine replaced. It is an extremely small, quiet town with a sort of "way past its heyday" feel. The main boatyard, River Forest Marina is a shabby place in disrepair and disorder, complete with a dilapidated manor house. Based on the way they run their docks, we would not let them touch our boat for any reason. We needed to get ourselves to Oriental, a good sailors' town with some very good yards. But not an easy task. No good options. Daystar sails well, and we would much rather sail than motor when we have room. 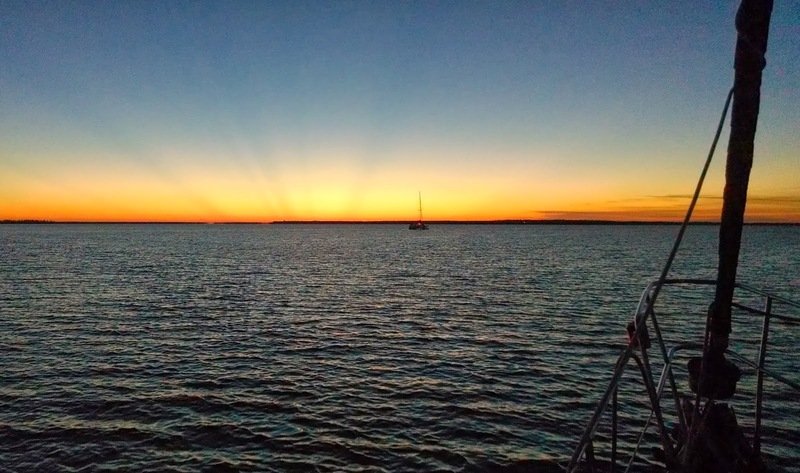 The ICW route from Belhaven to Oriental includes a number of rivers with enough room to sail: the Pungo, Pamlico, Bay and Neuse. 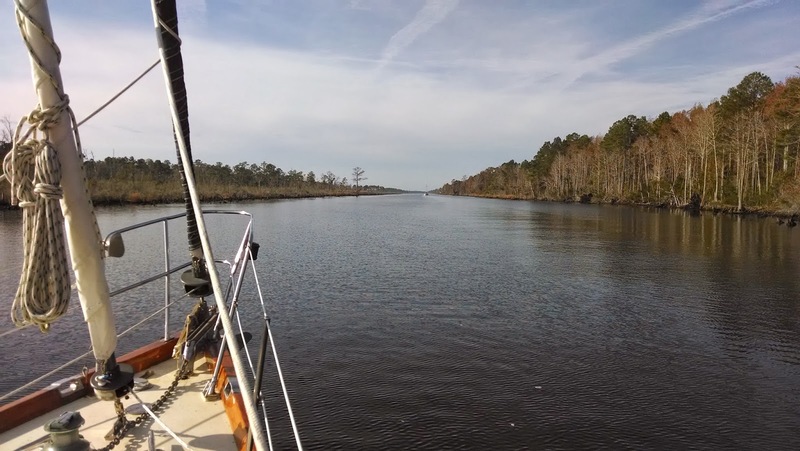 However, after the Pungo, the ICW goes through Goose Creek which is much narrower, and that is followed by the 5-mile Hobucken Canal, which definitely requires a motor. 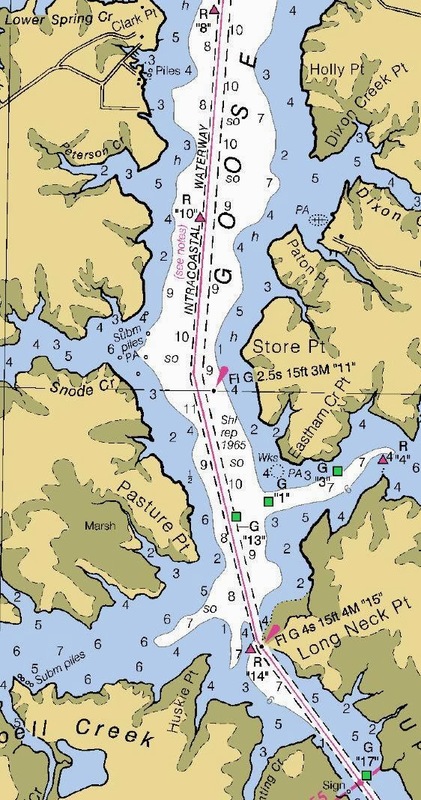 The alternative to this was sailing east through Pamlico Sound, but this sound is filled with treacherous shoals, is notorious for its roughness in high winds, and has absolutely no sheltered place for us to anchor if needed. The forecasts called for 25-30 knots from the north for the next few days.In short, there was just no good way to make this passage happen any time soon. 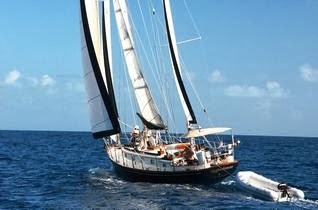 As we went over and over our unworkable options, a newly-arrived sailor happened by, making kind remarks about our boat. We invited him aboard for a beer and hit if off right away. 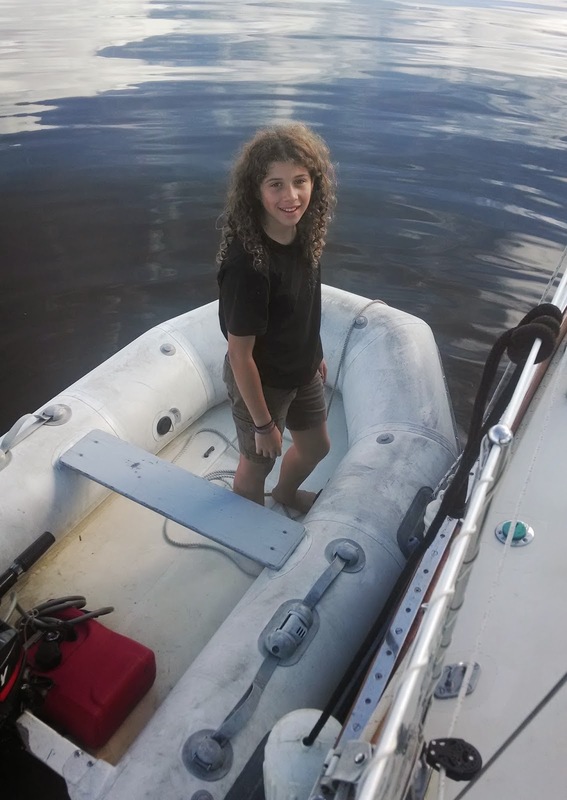 Ethan was captaining a catamaran for its new owners on its maiden voyage down the ICW. He suggested they tow us all the way to Oriental. 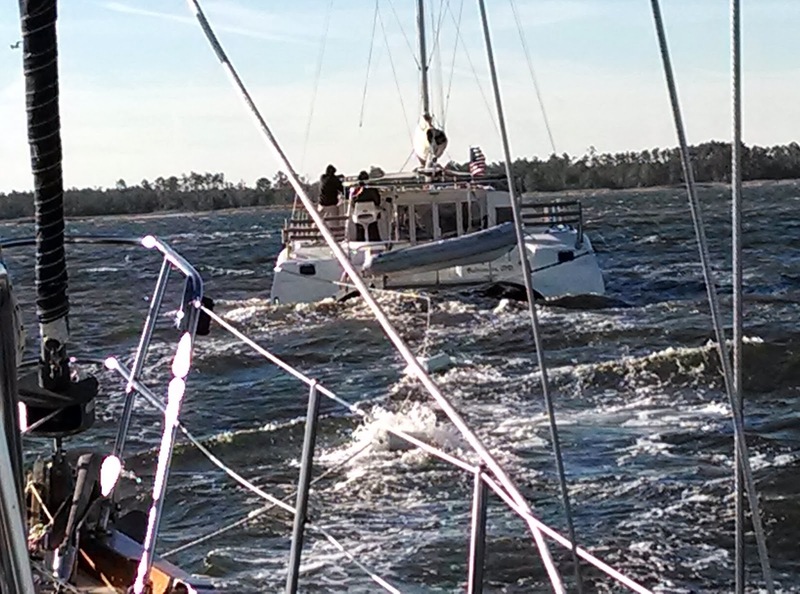 While this was a very generous offer, it was not one to accept lightly; being towed by another boat in 25 knot winds in an area with lots of shoals brings risks to both boats. Greg spent a fair amount of time talking with Ethan to evaluate his skills, experience, and judgement before he felt comfortable with the idea. (Ethan turned out to be extremely capable in all respects and a very good guy. And someone who leads a very interesting life of adventure). This plan would not work without precise planning and constant vigilance throughout the 9-hour trip. Greg and Ethan put their mechanical-engineering heads together to plan the tow connection to both boats. 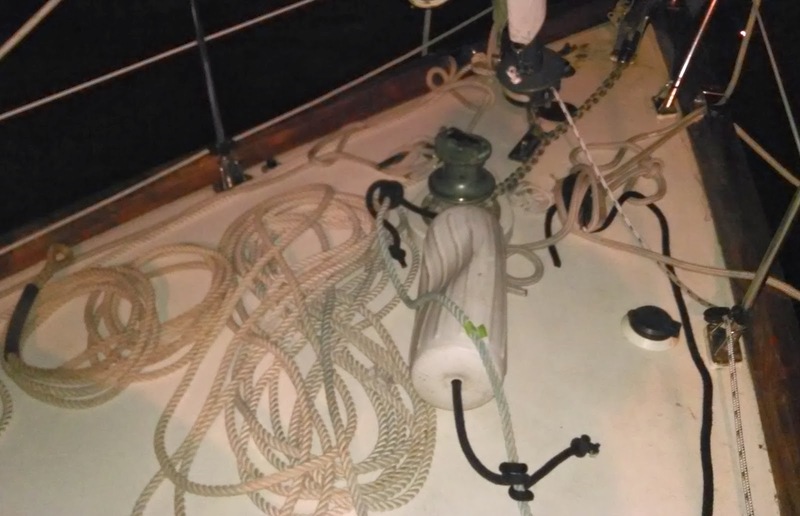 The tow rope connected to a harness on Daystar that led through both bow-chocks to a bridle on each side. Each bridle was attached to a bow cleat and also led aft to a midships cleat to distribute the load (i.e., keep stuff from tearing off the boat.) Espiranza had something similar, and fenders were tied in two places on the tow-line to keep it floating. to put up sail for more speed and more stability, but that option would mean a difficult re-connection for towing us into the Oriental channel.We continued to motor south-southwest through the chilly wind and waves. As we neared the channel entrance to Oriental, we started our engine in anticipation of cutting loose the tow-line once in the basin. (We put this off until the last minute because we didn't know how long the motor would last.) Ethan took us beautifully around the channel entrance mark, and made an acute turn back to the north. I set lines and fenders on our port side in anticipation of docking. 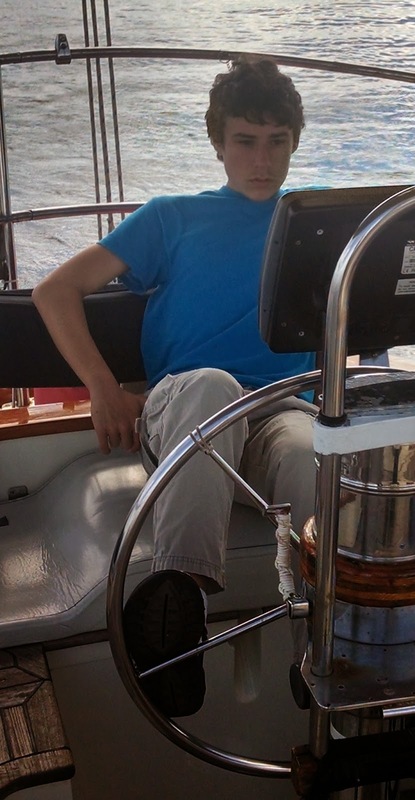 We moved along the channel toward Whittaker Creek at greatly decreased speed due to the increased chance for grounding, and Greg kept in constant dialog with Ethan on the VHF. Nicole kept watch on the engine - coolant was starting to make its way out as the engine heated up. Cash kept his eye on the depth; it was falling, getting pretty close. Nicole reported that the coolant was now rising fast. The marks were confusing - difficult to tell whether the green can was for the split to the right or to the left. Greg and Ethan - constant talk on VHF, Cash - depth now just under our keel, Nicole - coolant now half-way up the chamber, Greg and Ethan - not not sure where the bottom is. Then Ethan over the VHF yells, "I found it!" He is aground. Amazingly, Greg keeps calm as we continue to move ahead (we are somewhat sheltered from the wind, so there is nothing to slow us). We need quick action so that we don't also run aground or hit Esperanza. Greg turns to starboard and orders us to cut the tow line. I run forward and uncleat the lines at the bow. I push the harness through each chock and throw the large bundle of extra line overboard; we are free. On Esperanza, the crew furiously pulls in the tow-line while Ethan reverses hard to get off the shoal. Greg steers Daystar past Esperanza and pushes the throttle to give us as much power as possible, hopefully without blowing the engine. We need to act fast to figure out what to do next. Our marina is further up the creek and it is unclear how to maneuver past the shoal. Another marina lies to our right, with an open face pier. In less than a minute Cash and I rig lines on the starboard side, just before Greg gets us alongside the pier. Cash and I leap to the dock to snub the bowline and springline to stop our forward progress. Nicole leaves her post at the coolant to help fend us off the pier. We are docked; we made it. Just as we started to ready the dinghy to help Esperanza off the shoal, they managed to back themselves off into deeper water. We untied and slowly motored across the basin to our intended marina for a much calmer docking. Celebration all around! What a difficult and exhilarating experience this was! We were both exhausted and elated. Things could have gone wrong at many points. Greg's calm under pressure and his ability to analyze problems and difficult situations, and our smooth work as team in crisis meant we could get ourselves where we needed to be without causing further damage. But now we've all yelled, "uncle," okay? We'll stay a bit in Oriental and get our engine straightened out. And then, bring on the adventures, but we're really looking for the non-engine-related kind!